Ham is a specific cut of meat that comes from pigs. The meat is usually sold cooked or cured, but can be found in raw form as well. 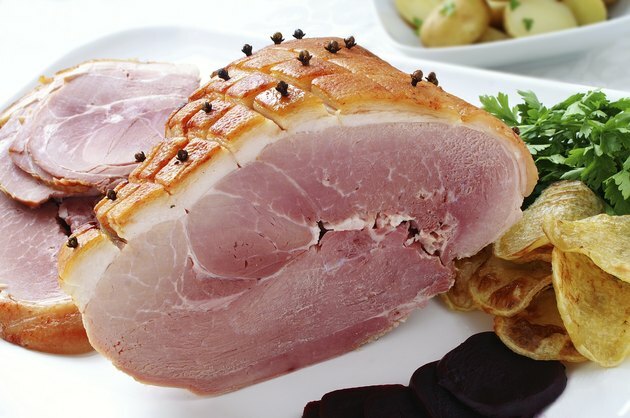 Ham is popular for use in sandwiches and also for roasting in an oven. Roasting hams are usually for gatherings or celebrations because they can feed several people. Hams are most often thawed before roasting, but you can cook a frozen ham without thawing it. Set the baking rack into the baking pan and sit the ham on the rack. Cover the roasting pan with the lid. If the pan does not come with a lid, use foil to completely cover the roasting pan opening and the ham. This will keep the ham from drying out and dismisses the need to put water in the bottom of the pan. Preheat the oven to 325 degrees Fahrenheit. Place the roasting pan inside the oven and slow roast. A large ham takes 18 to 20 minutes for each pound to cook. A frozen ham will need one and a half hours more to cook than an unfrozen ham. Use a meat thermometer to check the temperature of the ham every few hours. Checking the internal temperature of the ham is important to determine if the ham has been cooked all the way through. The internal temperature of a ham should be 140 to 160 degrees Fahrenheit. Remove the roasting pan from the oven once the internal temperature of the ham is within 5 degrees of the correct range -- 135 to 155 degrees -- and sit it on top of the counter or stove for around 15 minutes. The ham will continue cooking for this amount of time outside the oven. Add any glaze to the ham in the last 30 minutes of cooking for maximum flavor. If the exterior of the ham is cooking faster than the interior, reduce the oven temperature a few degrees, but never drop below 200 degrees Fahrenheit. Never roast a ham under 200 degrees. This environment is a bacteria playground.